Schatten Design's is a company based in Canada largest manufacturer of pickups, transducers and other technical material for string and folk instruments. Well I've always wanted!! It was a childhood dream to me... It always looked a bit out of reach and too expensive for me. Then of course you could find a cheap Pakistani harp or middle eastern import.. and they may look so pretty, even engraved.. but don't fool yourself, after asking the advice of my friends harp players that actually know what it's playable or not, they told me to run away from this harps that are only "ornaments" and that will most likely will bring only dissatisfaction after a little while with low quality levers and materials, something that instead of a bargain will end up in your attic or wall getting dust. Harpsicle though are made in Indiana in the United States with fine materials and craftsmanship. 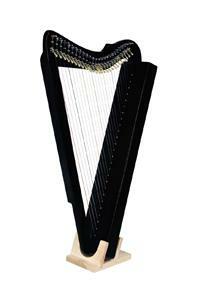 They can be purchased from a lot of specialized stores and harp centers worldwide. 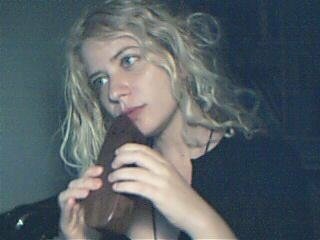 I have myself a 10 strings kantele made by Gerry Henkel, and it soothes my spirit you can´t imagine how "heavenly" souding such apparently simple instrument can be. Oscar De Los Santos is a noted Artist, poet, inventor, and musician, as well as the youngest recognized Elder within the Six Nations Community and Medicine man. He is also the creator and author of The Warriors Roadway, and the founder of his own company called Tribal Thunder that makes handcrafted percussion, drums and wind instruments. From native american flutes to Indian Tabla there are a wealth of items to find your own rhythm, to enjoy, to spin, to play, to heal with it. he really does show the spiritual value of his craft. 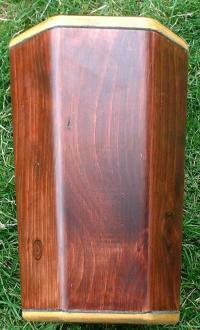 Oscar is also the inventor of their popular Oscar Steel-tongue Drum, their own trademarked hank drum. I own an Oscar and I love it, my model has six notes but you can find models in different keys up to 8 notes. It has a lovely bell sound and very soothing and relaxing. Above: the Oscar Drum, their most popular item in its standard and Slim model. I'll highlight the Ashiko Pony Drum: Named after the celtic Horse goddess Epona is a Tribal thunder special design, an hybrid drum mixing the qualities of the Ashiko and Djembe. 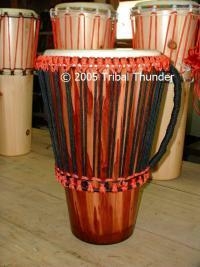 The drums are built like the Ashiko (pine staves) but are somewhat shorter with larger heads (like a Djembe). The large head and small throat make for an incredibly powerful sound! The rings for this premium drum are leather wrapped and there are more ties for greater stability and balance in the head. Must be heard to be believed! I certainly would love to grab my hands around one!! They also make other really interesting things... I have this lovely wind talk band... it sounds like Australian bull roarer but they´re very much more in control and you can even can change the pitch. All you have to do is to spin it and a storm-like roam will chant similar but different to the didgeridoo (which by the way they also sell)- It can make two harmonics depending on the angle used, I use it a lot to chant and meditate, shall upload a video using it as soon as possible. 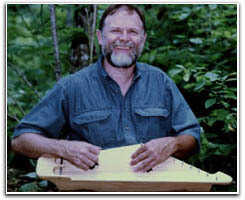 Ron Ewing has built and played about 1700 dulcimers since 1970 to date and can offer his customers the benefit of considerable experience as both a craftsman and a musician.he does build fine, attractive instruments at reasonable prices, in a variety of styles, and use only solid domestic and imported woods, selected for their tonal quality, beauty, and compatibility. Ron studied engineering and English Lit in college before he got the bug to build and play upon hearing a recording of the wonderful Richard and Mimi Farina. he apprenticed with Chet Hines - a retired civilian engineer by trade, and a builder and player of some renown in his later years. He grew up in southern Ohio and learned the craft from his grandfather. After a couple of years he took over production and built about 200 dulcimers for Chet before heading off on his own to study guitar building and develop my own mix of the traditional and modern. As a musician he has performed and taught throughout the country and is particularly known for his lively renditions of traditional Irish, Appalachian, and Euro dance tunes. He has guested on several recordings, including Jerry Rockwell's wonderful, "The Blackbird and the Beggarman." Most recently, I can be found playing the Irish slip jig "Drops of Brandy" with Jerry Rockwell and Leo Kretzner on "Dulcimer Celebrations" - a collection of live performances from Mountain Dulcimer Week at Western Carolina University. Charlie Hind grew up on St. Simons Island, Georgia. He first began experimenting with making wind instruments in 1975 while a student at the University of South Carolina, where he later received a Master's degree in music education, with an emphasis in clarinet and viola. 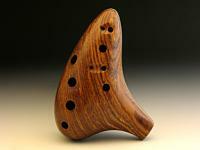 Over the years he has designed and built recorders, flutes, xylophones, panpipes, and since 1982, has concentrated on a wide variety of ocarinas, which he sells worldwide through his online store. Since 1975 his constant experimentation with wood and sound has resulted in the creation of many new and unique musical instruments. In 1985, after designing and building a pipe organ, he was inspired to come up with a way to make the organ "play by itself." This led to years of intense study of all types of mechanical musical instruments, culminating in the building of two cylinder music boxes completely "from scratch," an accomplishment rarely attempted in the twentieth century. 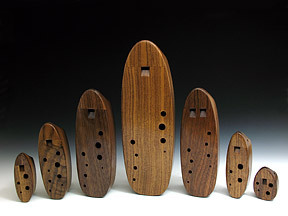 Three years later, he created the unique Ocarina Celestina, a hand cranked organ that plays twenty of Charlie's trademarked walnut ocarinas automatically by reading perforated paper rolls similar to those used by a player piano. 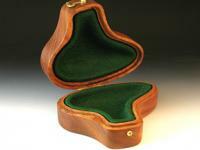 It is the result of over 1200 hours of work and is the only one of its kind in the world.